I never have given much thought into those photo challenges that you see around different sites. In part, I don’t think of myself as a good enough photographer when I see some of the photos that are submitted. It is once again that mind-set of me comparing myself against the world… when it really I should be looking at if I’m happy with it, the heck with everyone else! In June one of the blogs I follow – Nick Exposed – joined up with another blog – Seeing Spot Photography – to put together photography challenge. I glanced at, but again, didn’t put much stock into. At the start of July they posted the gallery of pictures taken. The one thing that piqued my interest was how they spun this as it is a community project. And that they wanted people from all levels to participate. That was certainly different from others I had seen. Then this past month they announced another community project. This time it was focused on capturing silhouettes. After thinking on it for a few days and having ideas come to me. I decide why the heck not give it a try. It would be healthy for me to stretch out and try some different things. I quickly learned that trying to capture a silhouette is not as easy as it looks. The lighting has to be just right and behind the subject. Yikes! I did manage to capture a couple of pictures one evening as I walked my little town of Sedro-Woolley. I meant to try to get out more during the month, but as always… everything else in life seemed to come first. I did submit one picture from my walk and it was just published this last week on Nick’s blog along with other contributes from the month. All the photos look great. Make sure to take a moment and check them out. And I highly recommend joining in on the next community project. This is the photo I entered. 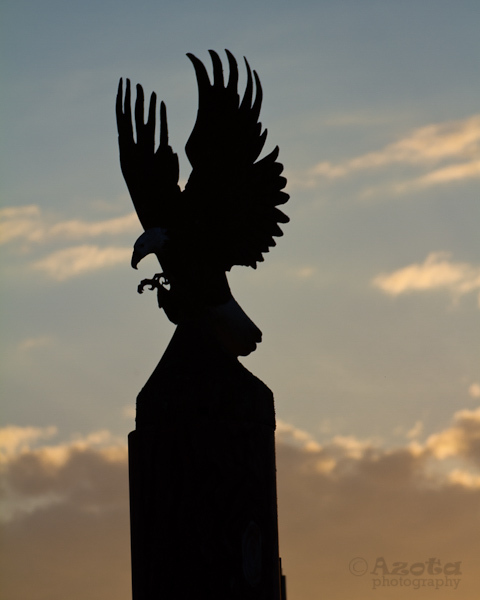 The subject is a metal post made to look like a log with a wood carved eagle at the top. I didn’t actually submit this one. 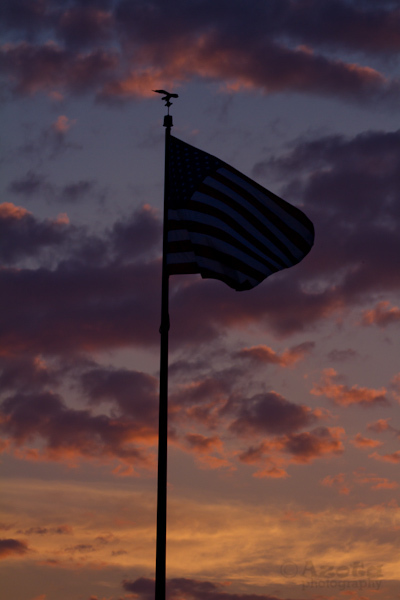 I had to actually use LightRoom to bring down the color of the flag to make it look more like a silhouette. Felt like I was cheating a bit too much.